The 2019 IU Executive Development Program is SOLD OUT! 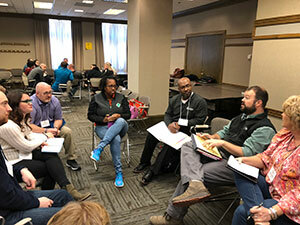 For 52 years the Indiana University Executive Development Program has helped park and recreation professionals at the local, state and national level who are in front line, management, and leadership positions build and strengthen the fundamental skills needed to manage and lead in a public and non-profit setting. IU EDP is organized around a two year curriculum focusing on leadership and management skill development. To continually offer cutting edge education opportunities, the curriculum is reviewed annually by the IU EDP board of Trustees who are past program graduates. IU EDP sessions are longer than many similar continuing education programs. Most class lengths are 3.25 hours. This longer class period allows for an in-depth discussion of a particular topic and for greater sharing among participants. Over 17.5 hours of professional instruction! Each interactive EDP session will not only address important issues that face professionals, but business topics that impact departments will be discussed as well. Graduates of the 2 Year IU EDP are invited to return to the program. IU EDP Alumni can earn 2.0 CEUs by attending the full program. Reconnect with EDP by networking with park and recreation professionals from throughout the country and learn something new. For more details contact Julie Knapp. IU EDP is located on the campus of Indiana University in Bloomington, Indiana. Bloomington is just one hour south of Indianapolis and is in close proximity to major metropolitan areas such as Chicago, St. Louis, Louisville, Indianapolis, and Cincinnati. Air transportation is available through the Indianapolis airport which is serviced by several major carriers. An airport shuttle service is available from the Indianapolis airport to Indiana University via Go Express Travel. Call 800-589-6004 for more information. The 2019 IU EDP will be held in the Indiana Memorial Union Hotel and Conference Center. The Indiana Memorial Union is the heart of the IU campus. This campus centerpiece is conveniently located next to IU attractions and is within walking distance to over 20 restaurants and downtown shopping. What makes IU EDP unique? 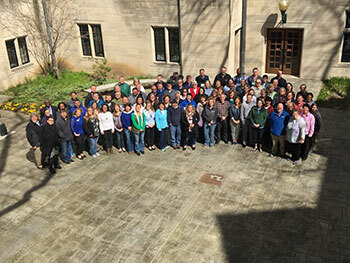 IU EDP is the original Executive Development Program dating back to 1967 and it has established a solid commitment to the profession, and has a reputation for excellence in the field of parks and recreation. IU EDP instructors come from all over the country to bring a fresh perspective to participants. All instructors have one thing in common- many years of experience in the parks and recreation profession. IU EDP believes that class size has a direct impact on learning, so classes are held to a maximum size of 40 people. One of the important tenants of IU EDP is the building of lasting relationships among participants. Networking opportunities are a priority. Over 1,700 professionals have completed the IU EDP program. Finally, we commit ourselves to YOU, the park and recreation professional, to help you become more effective in your career. Who should attend IU EDP? Individuals in management, leadership or board positions will benefit from IU EDP. A variety of out of class opportunities are offered during EDP such as tours of IU sport facilities, Brown County State Park evening tour and dinner, canoeing on Griffy Lake. These activities will provide participants with an opportunity to get to know classmates in a non-structured atmosphere. Informal optional group dinner outings will also be scheduled for Monday and Tuesday night. Seven 50% registration discounts are available for the 2019 program. Contact 812-856-1068 for an application and criteria (deadline is 12/15/2018).